Seeing as I have 4 tickets to give away, I'll give away 2 pairs of tickets to 2 winners. Same rules as always, and if you decide to comment 50 times you still only get your name in the draw once, same with emailing me more than once - you only get one entry into the draw! If you want to comment here, leave an email address for me to contact you on, if you want to email me, simply send me an email to mrsythe[at]gmail[dot]com and make the subject "I want Sean Paul". Now, while on the topic of free swag, today is the last day to get your name in the draw to see the Ministry of Sounds' Nathan C live this Thursday at the Jabreen ball room in the InterCon. To get in on the draw simply click here and read! It's mere force of habit now...! But actually, yeah! "the name's ME..... PICK ME!!!" Omg!!! I soooo badly want SEAN PAUL!!! He's awesome! I gotta win this time!! I want! I want sean paul!! I really want Sean Paul! 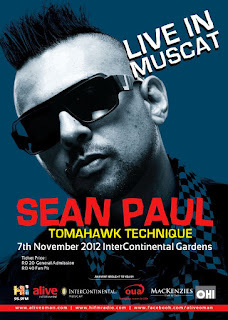 Ido want Sean Paul :)! Would love to get Sean Paul tix! I want Sean Paul Tickets! Wouldn't want to miss this!